Listed here are some of the varieties that we often sell as seeds, seedlings or as pot plants. Our pot-plant and seedling selection can be seen here. 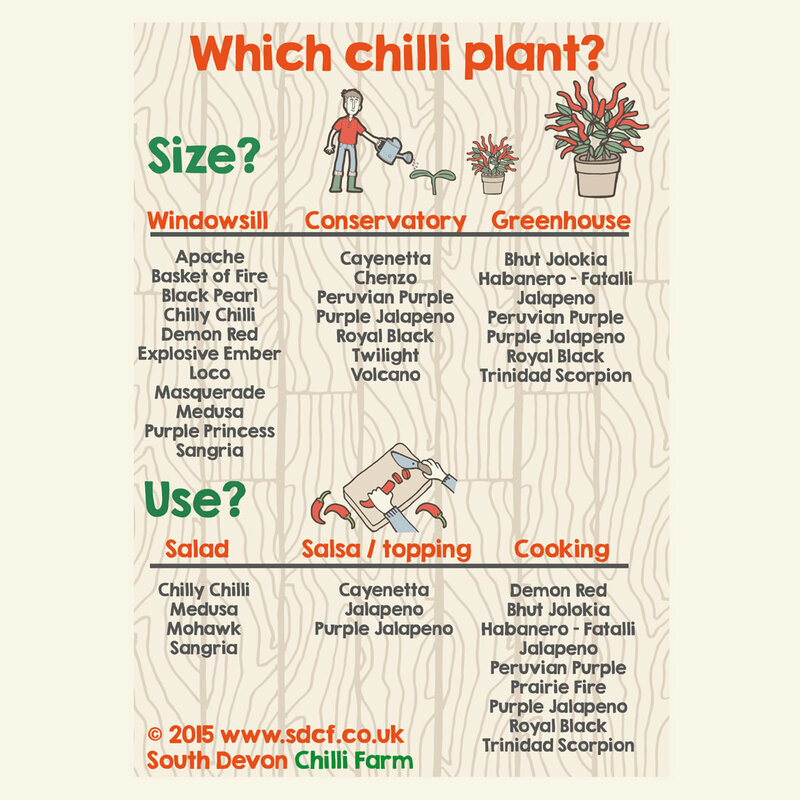 We also have a 'Which Chilli Plant' graphic guide to help choose the best seed or plant for your needs. Apache is an F1 hybrid – which means it has been bred for qualities such as: reliable yield and good vigour. They are very productive chilli plants with a long growing season.They usually start fruiting in June/July and continue through to December.The fruits are 1-2 cms long and dry well either on the plant or after harvest.The chilli fruits are hot (around 70,000 – 80,000 Scoville Heat Units) - you only need one or two in any dish. This was the first chilli to record a heat level of over 1 million Scoville Heat Units (SHU), this chilli should be handled with care, literally !! This chilli held the world record for hottest chilli in the World between 2007 and 2011. Every year there are new rivals for title of world's hottest, such as the Trinidad Scorpion and Carolina Reaper. All of the super-hot (Extreme) chillies can be tricky to germinate and are slower to produce ripe fruits. The fruits usually ripen from August and if you can get past the heat, have a fruity flavour; they are frequently used in Caribbean cooking. This is a very attractive chilli plant with striking black foliage. It produces small hot chillies which turn from a shiny black to red. Cayenetta was bred in the UK to be a compact plant with good garden performance.These plants are ideal for containers. They produce fruits which are 7.5cm long, green maturing to bright red. The fruits are tapered and bayonet shaped with a medium heat. One of the few heatless varieties that we grow here at the chilli farm; these are good if you want something “child-safe” and “pet-safe”. The fruits are about 5cm long and ripen to orange, then dark red. They add a colourful touch to a salad. This is a stunning scotch bonnet / habanero type originating from Jamaica. Similar in appearance to other Habanero chillies but chocolate brown in colour. The bushes grow large with strong woody stems. Sometimes difficult to germinate, but well worth the effort. Heat Level: up to 600,000 Scoville Heat Units. This small hot chilli plant has been bred for growing in containers indoors or outdoors in pots - on the windowsill or patio. Height approx 35cm. Very prolific fruiter with upward facing 4cm long fruits. Used a lot in Thai cooking. RHS Award of Garden Merit. A beautiful chilli pepper. With its dark purple leaves and purple peppers. The 2.5 cm long fruits change colour during ripening from dark purple to orange and end up bright red. An eye catcher for every garden. Its compact size (25-35 cm) makes it very suitable for pots. Heat level: 30,000 – 40,000 SHU. A very attractive and neat plant with cone-shaped fruit in a rainbow of colours from purple, through yellow and orange, to red. Very hot fruits on a 40cm-high, bushy plant. Fruits can be chopped finely and added to cooking. Harvest: Pick when fruits ripens to red - about 80 days from potting-on. Heat level: Hot - 30,000 - 50,000 Scoville Heat Units. Small, dark green leaves are the backdrop for masses of peppers that begin as yellow tinged with purple, then turn orange and finally red. The tiny fruit is no bigger than 1/2 to 3/4 inch long and appears in clusters, with all colors on the plant at the same time. Plants grow no bigger than 16 inches tall so they are great for borders as well as container growing. This is a compact, spreading plant that produces orange bell peppers. Looks a little like habanero fruits but with no heat. This is the most commonly grown Habanero and one of the easiest to grow. This is probably the most prolific habanero variety we have grown. The fruits are a wonderful orange colour, very hot and fruity. Heat level: up to 350,000 Scoville Heat Units. A pretty, edible ornamental with 2 cm round, ball/teardrop fruits. The fruits are medium heat and ripen from purple to red. Good for growing in pots to about 50-60 cm high with plenty of fruit. The leaves may also have purple tinges. 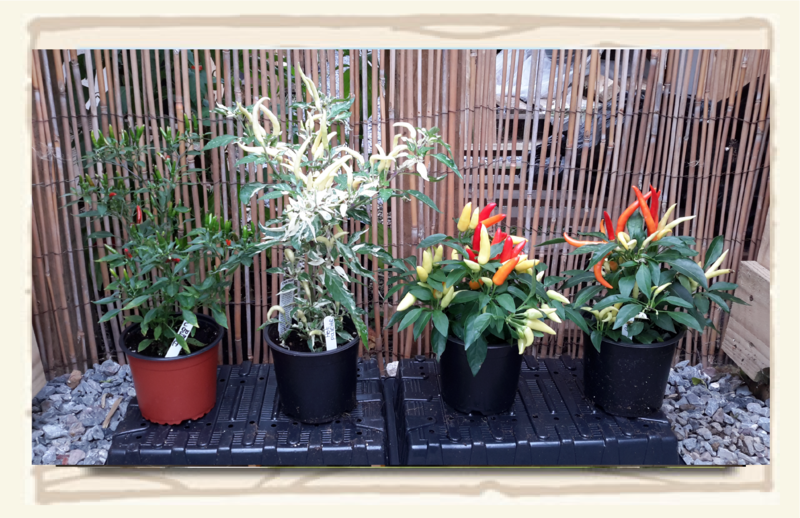 This is a very attractive chilli plant that produces an abundance of small hot chillies. It is a compact plant with greeny-violet leaves that produces dark green fruits which grow pointing upwards and ripen to a reddy-violet. Hot chillies - only one or two needed in any dish. Ideal as a pot plant for indoors. The fruits are early ripening. A distinctive chilli plant with gorgeous tricolour foliage, purple, green and white.Pot size restricts growth so this is ideal on a sheltered patio or makes a great pot plant for a border with a long season of interest. It has teardrop shaped fruits that mature from purple to tricolour to red with the final result of medium hot, distinctively flavoured chillies. This bright-red Habanero plant produces large fruits up to 5cm long. The fruits are very hot. Heat level: up to 350,000 Scoville Heat Units. This chilli has dark purple foliage and stems, almost black with an occasional variegated growing tip of green, purple, and creamy white. It produces bullet shaped hot purple/black fruits. Heat Level: 5,000 – 30,000 Scoville Units. Very Hot variety originally from Thailand. Plants become covered with 1-1/2 inch long peppers that are green at first but ripen to red. Both colors appear on the plant at the same time making this variety ornamental as well as edible. Thin fleshed peppers are used especially in Oriental dishes. As the name might suggest, this chilli has a powerful sting! This chilli to joined the Bhut Jolokia by recording a heat level at over 1 million Scoville Heat Units (SHU). It is sought after by heat seekers and we have successfully started to grow this chilli in reasonable quantities. Recorded Heat level: 1,400,000 Scoville Heat Units. This is a beautiful shrub-like bush which can grow up to 1m tall. It is covered with small upright multi-coloured chillies with purple, orange yellow and red all showing at the same time. We use it on our promotional flyers. This is the one of the chillies grown in the 2006 BBC Gardeners World Chilli Trial after their visit to film us in the Autumn of 2005. Another compact upright variety, these chillies are rounder and fatter than the traditional Thai chillies and have a slightly sweeter flavour when ripe. They are small plants but they produce a good spread of small green chillies that will ripen to red in late summer. Volcano has a spectacular-looking eruption of bright red chillies, held upright in distinct bunches like volcano craters. The chillies are hot at around 65,000 Scoville Heat Units.